Retail $3.19 SAVE 70% ! SPECS: Two piece folding wing with 12" wing span, flat wing design. Plane has printed wing, tail and canopy surfaces. Preset wing position is balanced for proper flight. Planes can soar over 50 to 60 feet. These are "sling launch" planes. Wings automatically fold back until glider reaches peak altitude. One sqare of bright orange wing tape. No glue required, these are a snap together type construction. 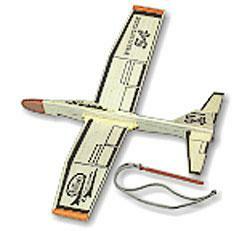 These gliders can soar several hundred feet if they catch a good breeze.